【LUXURIOUS SOFT TOUCH VELVET SELF TANNING MITT】Unlike many cheap foam mitts, this luxury premium velvet mitt is both soft and luxurious to the touch, helping your self tan glide onto the skin beautifully. Long-lasting fully re-usable and washable velvet tanning mitt perfect for delivering totally even self tan applications time and time again. 【DOUBLE SIDED TANNING MITT APPLICATOR WITH THUMB】The tanner mitt is double sided so you can use them on either hand. Plus, the thumb area gives you extra control in keeping the mitt right where you want it so it doesn't slip off of your hand like straight mitt tend to do. 【HIGHEST QUALITY STITCH CONSTRUCTION】Many mitts are chemical or heat sealed. 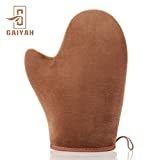 GAIYAH self tanner mitt is carefully sewn together with highest quality stitch construction. This creates a mitt which will outlast any on the market in durability and use. 【HIGH QUALITY WATER-PROOF ISOLATING LAYER】GAIYAH tanning mit has an high quality water-proof isolating layer on the inner side, which protect your hands during application to prevent your palms from tanning. 【MULTI-USE】Gaiyah sunless tanning mitt is amazing for self tanning / sunscreen / body lotion application and blending. It will work effortlessly with all tanners, creams, mousses, tinted moisturizers, body lotions, and sun block lotions/sprays on the market including. Shenzhen Zeblun Technology Co., Ltd.